Crusher was one of many disfigured freaks that opted to shy away from society, hiding away from the world in Chicago’s underground region. He was present when Dragon led a number of his fellow police officers to evict the freaks from their home. The tribe were forced to relocate to an abandoned church to live. 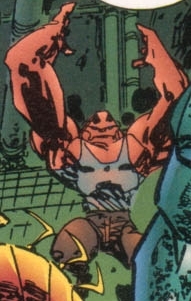 When Dragon was hired to lead the United States government’s new hero team, the Special Operations Strikeforce, he headed to the underground to recruit some of the freaks there. Crusher was one of those that accepted the position but unfortunately for him, a mission involving the deadly Rogue Warrior led to his death. The villain was about to be taken into custody when the hero Kill-Cat intervened, accidentally causing the deaths of the three heroes present.